The OMA is pleased to share its response to the Ministry of Tourism, Culture and Sport Discussion Paper: Telling Ontario’s Stories in the 21st Century (read the response HERE). Thank you to the organizations that shared their responses with us by emailing them to communications@museumsontario.ca (it’s not too late to send yours!). The discussion paper was intended for heritage and museum organizations across Ontario. Given the restricted timeline, we are aware that not all interested parties were able to respond. Please complete this quick, anonymous survey to help us understand how many people were able or unable to respond and if you are interested in regional consultations for the review and update of the museum and heritage funding programs. The information gathered in this survey will be for the OMA’s internal use only and will inform our discussions with the Ministry. Use the easy response form (download HERE) to write your response. Respond to culture@ontario.ca by March 20, 2018. Please share your response with the OMA by copying communications@museumsontario.ca. We invite members to share your response with the OMA by copying communications@museumsontario.ca. The Ministry of Tourism, Culture and Sport released Telling Ontario’s Stories in the 21st Century : A Discussion Paper for Community Museums and Heritage Organizations, to consult on the Ontario Culture Strategy and its recommendation to “review and update provincial funding programs for community museums and heritage organizations to build capacity, strengthen leadership and support more diverse organizations”. 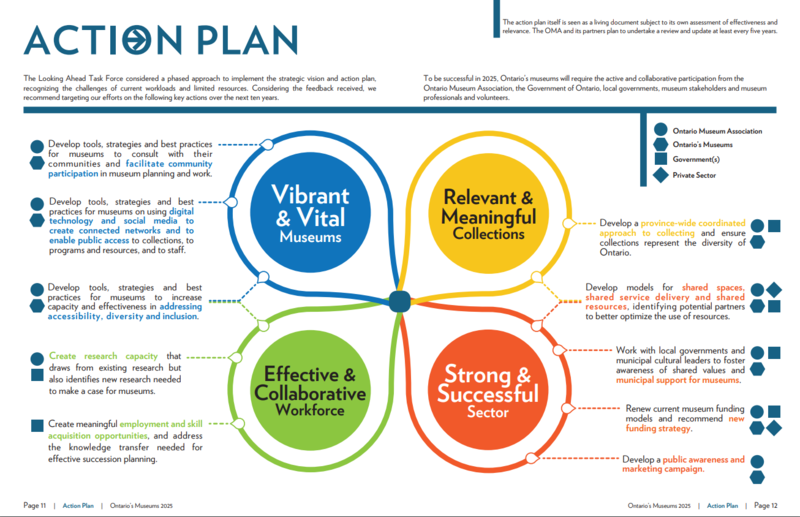 This recommendation is welcomed by Ontario’s museum sector and the Ontario Museum Association is working in close collaboration with the Ministry. 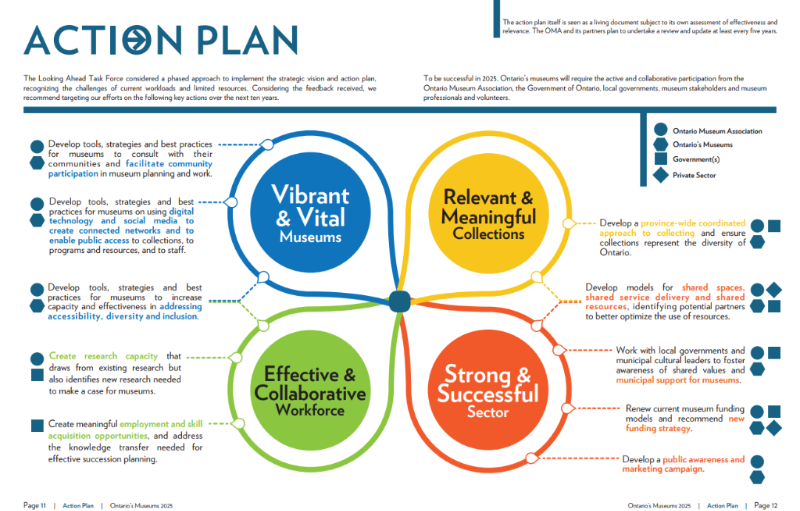 It responds to museums priorities and is central to Ontario’s Museums 2025: Strategic Vision and Action Plan; the sector road-map developed with broad consultation and surveys of hundreds of museums across the province, and guided by a task force of sector leaders. Consultation included additional input from interviews with key cultural stakeholder from all 3 levels of government, provincial heritage organizations, associations of libraries and art galleries, arts councils and arts service organizations, and many other partners, to ensure a strong foundation for museums to move forward with this vision. 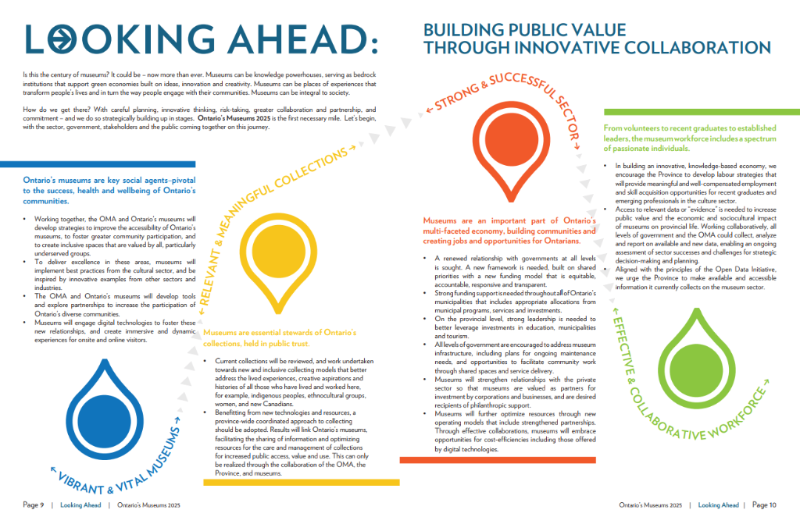 The development of Ontario’s Museums 2025 was also inspired by innovative work in other jurisdictions in Canada and abroad, and is recognized as the sector plan so that museums continue to play a fundamental role in creating dynamic communities, contributing to a prosperous knowledge economy, and building public value, becoming increasingly relevant to all Ontarians. For each of these outcomes, the document further provides detailed actions that respond to the questions raised in the Discussion Paper Telling Ontario’s Stories in the 21st Century. 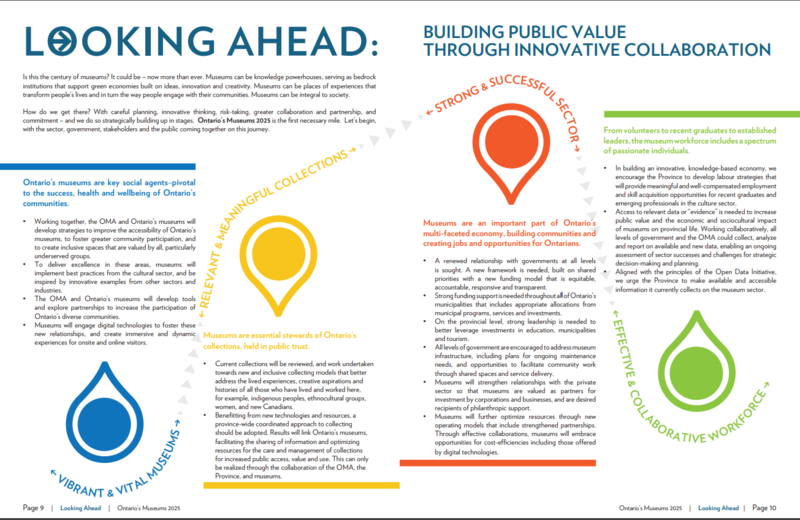 Ontario’s Museums 2014 Profile which includes data from Ontario museum surveys, partial quantitative data from CMOG, and Artsbuild, with additional references from the Department of Canadian Heritage Survey of Heritage Organizations and museums. Also in support of the questions related to Indigenous Heritage, we encourage members to consult the Association’s Indigenous Collections Symposium: Next Steps Report where both indigenous and non-indigenous participants identified important ways for the sector association to support Ontario museums in working towards reconciliation.